Sunday morning I got the call from Commander Tom. He stated that once he took care of some family responsibilities he would be available to fish Sunday afternoon. He suggested a trib by his house that was slush free and green. I agreed that I would be ready and waiting for his call to meet him at his house for an afternoon engagement. This was good news because I had been slumping since the flood water wreaked havoc on my stream and a change of venue was in order. I spent the early afternoon getting ready and dressed for the elements. As I looked up from the football game I noticed it was already 2:30pm and no call from the Commander had come down the pipe. I knew that he probably got caught up with pressing family responsibilities and so I made plan B. It was 37 degrees out and I was twitching like a crack addict waiting for his fix so I jumped in the truck and hit my stream somewhere around 3pm. There were 4 cars at the access point so I knew I was going to hit 2nd water at best but a man can’t catch fish sitting on his couch. I took a slow walk into the gorge taking my time as I slowly crossed the icy stream. I worked up stream to a slow tail out that I know holds fish. Well that is at least for competent fisherman. I was questioning my own skills after my mini dry spell. I shuffled my feet in thigh high green water to the outside of the shelf ice and look at my options. I played her slowly to my side and with the cold water she was more of a bulldog than a runner. I tailed her and placed her on the shelf ice to remove the hook and took a quick picture. She swam away hard and healthy. I was a happy man with a smile on my face. 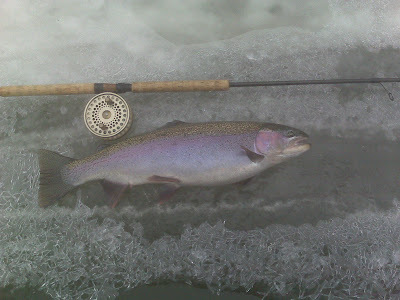 Though I only caught one fish, I was still happy as I was only out for and hour and a half and had to tolerate the constant flow of slush. There would be a price to pay for my redemption. That price was my back. The sunlight was slowly waning to half light and I knew it was time to make my way downstream to cross at a shallow area and make it out of the gorge. As I waded my way past the shelf ice to the near shoreline, I walked with authority to the bank on what appeared to be a gravel covered surface. In fact it was gravel covered muck. My right leg sunk in calf high and I awkwardly fell to my knees with a giant splash. I knew I damaged the back and slowly made my way out of the gorge and home. My self prognosis was sciatica. I had the tell tale signs of pain radiating from my lumbar region into my right calf and the buckling of the right leg from weakness with every spasm I experienced. Needless to say it was not a comfortable or solid night of sleeping. I was up every 15 or 20 minutes attempting to find a comfortable place to sleep. The couch, the bed, the living room floor. Sititng, laying standing. It all was not good. Today I am taking a day off from attempting to fish. I don’t think dragging my self down the shore in neoprene’s and corkers would be a happy experience but I got my dam redemption and that is good enough for me. Well back to the coffee………. Right on dude! Nice Hen. Redemption sure feels good after a dry spell doesn't it? I hope to find mine this Wed.
Nice fish Joe, with the extended forecast, I believe our steelhead days are all about over. My back is killing me too but at least yours is from fishing.